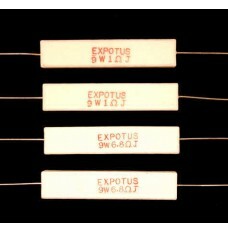 9W Ceramic Wire Wound and Metal Oxide Resistors for use in loudspeaker crossovers and networks. 9W Ceramic Wire Wound and Metal Oxide Resistors for use in loudspeaker crossovers and networks, close tolerance ( typically ± 5%). Available in other power ratings from 3W to 17W. Main Stock range 5W and 10/11W.